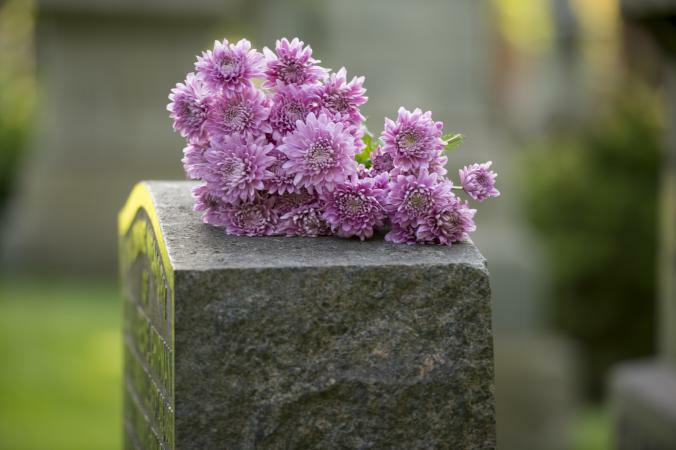 Beautiful poems about death are a great option for funerals. The readings for a funeral or memorial service should relate to the person who has passed while offering a universal message of hope that touches and even inspires those attending. Ideal poems should give voice to your grief and loss, making it easier to eulogize a loved one in this final goodbye. Firmament of complete and unbound freedom"
Khalil Gibran's poem "The Beauty of Death XIV" is one of the most beautiful poems of death; "The Ascending" is the second part of the three-part poem. It epitomizes the journey from life to afterlife with the poet describing the deceased's ascension from Earth to heaven. While the poem is bittersweet to those left behind, it brings a message that carries grief into eternity's everlasting love and hope. Christina Rossetti's "Remember" is a beautiful poem that speaks from death, reminding the grieving that a person is far more than the memory of their death. The grieving are advised to remember the life they shared. The deceased would rather not be thought of at all if it is always with grief and sadness. No winter without a spring"
"There Is No Night Without a Dawning" by Helen Steiner Rice is a great choice for the testimony of a life. While this poem is short and simple, it gives a very profound comforting message to those grieving - life is cyclical. Death is just the natural opposite part of life and is only temporary. They, too must complete their life cycle and once completed will be reunited with their loved one. Mighty and dreadful, for, thou art not so"
The famous poem "Death Be Not Proud" by John Donne is popular for funerals because it speaks about the inevitability of death. For some people the idea that no one can escape death is comforting when facing a personal tragedy. The poem ends with the promise that even death shall die and comforts with the thought of waking up in eternity. And remember only the smile"
Although not as well-known as some poems for funerals, "When I'm Gone" by Mrs. Lyman Hancock is a lovely poem about the right way to remember the people loved. It encourages mourners to recall the departed when the person was at their best, forgetting all the harsh words or unhappy days the person had. That's the way anyone would want to be remembered. I am not there; I do not sleep." "Do Not Stand at My Grave and Weep" carries a powerful message filled with hope, courage and faith. A friend's loss of her mother inspired Mary Elizabeth Frye to write one of the most beautiful poems about death. Frye's emotional support for her friend's loss encourages faith and hope throughout the poem. Written in 1932, this popular choice for a funeral poem has been added to over the decades and even turned into a song. "Because I have loved life, I shall have no sorrow to die. I have sent up my gladness on wings, to be lost in the blue of the sky." "A Song of Living" by Amelia Josephine Barr is an appropriate tribute for a life well-lived. It reminds those let behind that their loved one enjoyed and embraced life. The poem also expresses that the departed has no regrets but had a well-lived life filled with love and God. What more could anyone want said about their life? I am never without it (anywhere I go you go, my dear; and whatever is done by only me is your doing, my darling)." E. E. Cummings's poem "I Carry Your Heart" has a very personal message that's appropriate for the loss of a spouse or lover. It expresses the connection two souls have in such an intimate and profound relationship. It reminds how love transcends death and is eternal. The perfect poem for expressing the anguish of the loss of a loved one, W. H. Auden's "Funeral Blues" says exactly what most people are feeling as they deal with the loss of a spouse or other dear person. It's a heartbreaking, beautiful and true poem. But in the path we mortals tread"
Death is often unexpected and tragic. Comfort for the grieving seems greater for sudden deaths. "Consolation" by Robert Louis Stevenson offers great comfort to those left behind. It instills the hope of life after death and that each must travel the end of life's journey alone, only to meet up once more at the end of that trek.